ESP Orders can be synced with the QuickBooks desktop application and QuickBooks Online. The first step is to log into ESP at searchesp.com. Click on the avatar and select Settings. Click on Integrations from the options on the left. If you do not see Integrations, please contact your company administrator or ASI Technical Product Support at email support@asicentral.com. Use the dropdown to select QuickBooks Online or QuickBooks Desktop and then click on the Install button. After selecting QuickBooks Online from the dropdown and clicking on the Install button, you will be prompted to log into your QuickBooks Online account. 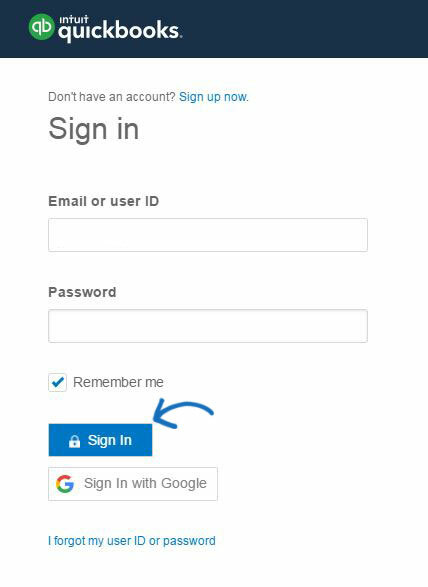 Enter your QuickBooks Online log in credentials and then click on the Sign In button. 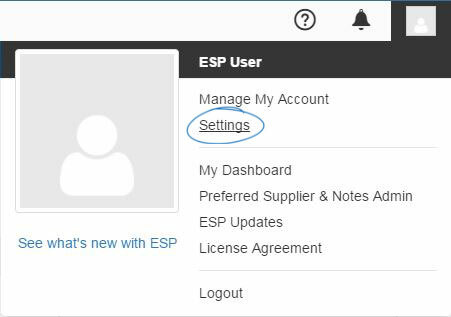 After logging in, you may see an authorizing message, but after authorization, your ESP Orders and QuickBooks Online accounts will be synced. You will only have to install the Web Connector one time. The Web Connector is provided by QuickBooks to enable data to be integrated. Click on the Install button to the right of Intuit QuickBooks. Next, click on the Download button. 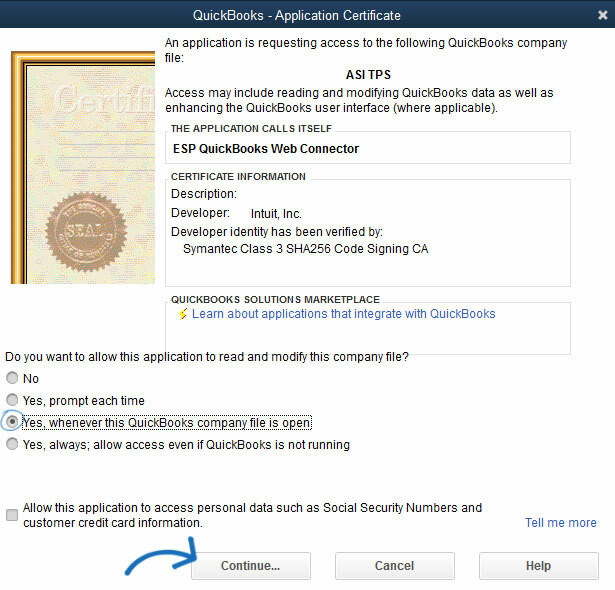 The QuickBooks – Application Certificate will be displayed. Select "Yes, whenever this QuickBooks company file is open" when the question of "Do you want to allow this application to read and modify this company file?" prompts you. Then, click on the Continue button to complete the installation. After installing the QuickBooks Web Connector, the status window will be displayed. 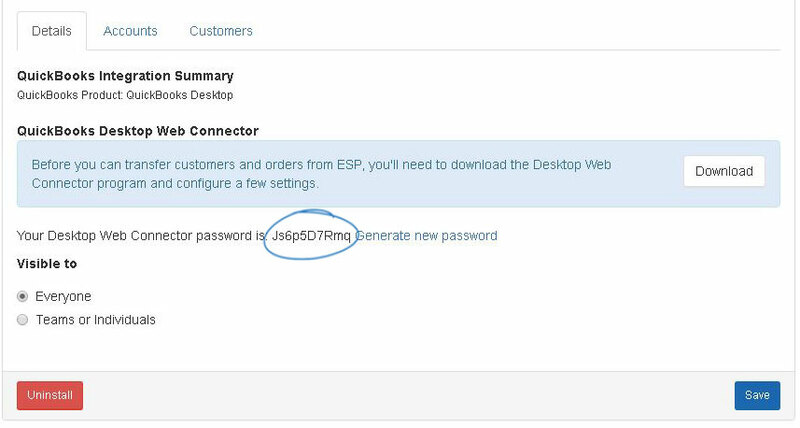 Copy the password from the ESP Orders Integrations page. Go to the QuickBooks Web Connector and paste the password in the Password box. A save window will pop-up, click on Yes. Next, check the Web Connector Listing and then click on the Update Selected button. You can hide this window at any time by clicking on the Hide button. The QuickBooks Web Connector will then be available on your taskbar. The QuickBooks Web Connector must be running in order to sync. You can also access the QuickBooks Web Connector by opening QuickBooks, clicking on File and selecting Update Web Services. The first order you sync will take a little longer, around a minute to complete. Syncing will be faster for subsequent orders. If you would like to change the refresh cycle time, enter the number of minutes in the Every_Min section of the QuickBooks Web Connector. Changing this number will not effect the speed of ESP. Integration is not retroactive, but if you would like to sync an order that you completed prior to integration, you can do so on a one on one basis. Once you have completed an order using ESP Orders, click on the QB button. The Send to QuickBooks window will open. To send information to a QuickBooks invoice, the name of the customer from ESP Orders for this order will appear in parenthesis and you can use the dropdowns to select your customer from QuickBooks. If the customer does not yet exist in QuickBooks, use the Create New Customer option and the system will automatically create a new customer in QuickBooks. If no customer is selected, you will not be able to check the checkbox. If you have tax setting established for a customer, you can select it or you can choose to use default in the Tax dropdown. Select the appropriate account from your QuickBooks for Accounts Receivable and Income Account. To send information to a QuickBooks bill, the name of the vendor from ESP Orders for this order will appear in parenthesis. Check the box next to Vendor. If you do not have this vendor already in your QuickBooks, check the box to create a new vendor. If the vendor already exists in your QuickBooks, use the dropdowns to search and select the vendor. Select the appropriate account from your QuickBooks for Accounts Payable and Cost of Goods Sold. Click on the Send button when you are finished. In QuickBooks, this information will now be available in the Transactions section of the Customers area. If the order contains a discount and/or payment (partial or full), this information will be included in QuickBooks. Within CRM, the QB button will be available on the Customer toolbar. You can use the search box to select a customer from QuickBooks to link with the Customer Account in CRM.